The tom yum gai looks simple, but is packed with complex flavors of lemongrass, galangal, shallots and kaffir lime leaves that layer tightly on one another. The heat comes from toasted dry peppers and the holy basil makes that heat interesting. The lime juice keeps the soup sharp and interesting. Tom yum gai is easier to make than tom yum goong for a couple reasons. Quality shrimp is hard to come by in the US. You can keep perfecting the tom yum gai’s flavors without impacting the chicken’s texture. Overcooked shrimp will turn hard. A couple weeks ago we went to a party and, an hour before we left, the host asked us to bring "something Thai". We had these ingredients on hand or in the garden, so we whipped this up as a last minute dish. The dish was a huge success and everyone asked for the recipe. Left over chicken makes great tom yum gai, too. Shorten the cooking time by cooking the chicken the day before without seasonings. 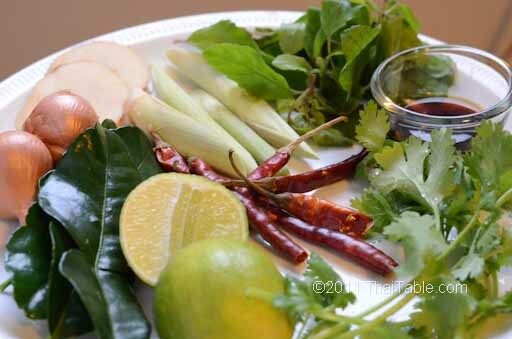 Add galangal, lemongrass, kaffir lime leaves and other seasonings when you are ready to make the meal. Always include the bones to make a flavorful soup. 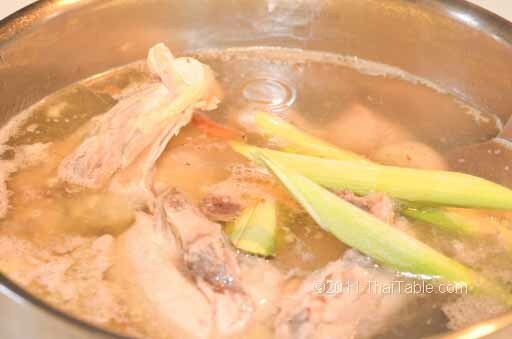 Additional dark meat with bones or just chicken bones will bring the flavor out. Tom yum should be hot and sour but it doesn’t have to be. Many kids and older adults can’t tolerate heat; I make tom yum gai mild for them. 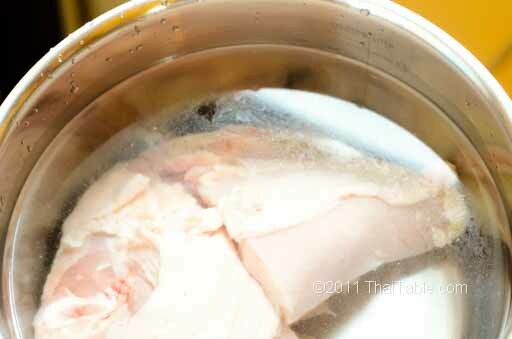 Bring water and chicken breast to boil. Let the chicken simmer while you prep. Add the sliced galangal to the soup. 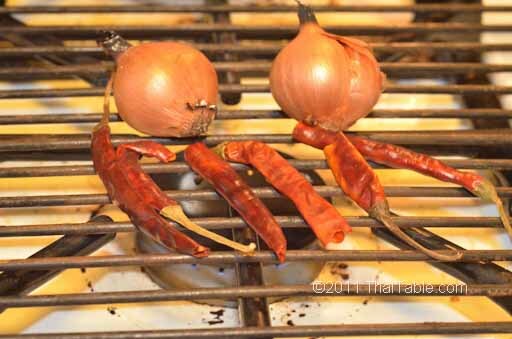 On your stove, grill the peppers and unpeeled shallots over low heat. It should take half a minute for the peppers to turn brown and aromatic. Set the toasted pepper aside while let the shallots continue to cook. Slice the ends of the lemongrass, leaving about a foot. Cut it in half and add to the pot. When the shallots are ready, they will be soft with burnt peel; remove the root and tip off from shallots with a knife. Peel the burnt part off from the shallots and drop them in the pot. When the chicken is cooked, take the chicken out and shred it into small pieces. Put the chicken back in the pot. Rip the kaffir lime leves from the center stem and add to the pot. Add fish sauce and lime juice. Taste to see that the saltiness is balanced with the sour. You may want to serve the soup with additional lime wedges. Ladle tom yum gai into individual bowls. Crush and sprinkle toasted peppers into the bowls. Garnish with holy basil and cilantro.